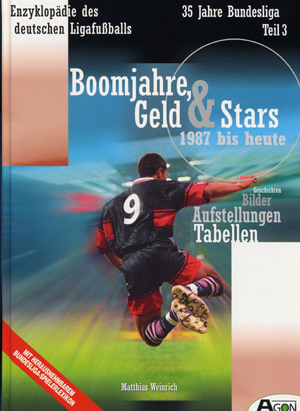 This is the 3rd Volume in the brilliant Bundesliga series, and runs from 1987-88 through 1997-98 seasons. As usual, a basic season synopsis, all lineups from every game, team photos and statistics. As an added bonus, a statistical pamphlet listing stats on all players since 1963 is included. It seems like it was an afterthought, as it's not part of the binding. (On the cover it advertises a "removable" section. Of course, more likely it will turn out to be "lose-able", so they should have just included it in the binding).